MINI OEM Spare Tire for all years MINI Cooper and Cooper S. If you have ditched the runflat tires and are nervous to not have a spare tire this is the most cost effective solution. This is a factory MINI steel donut with the 4x100 bolt pattern and measures approx 22 inches in diameter. This MINI spare tire will fit in the spare tire well in the MINI Cooper Clubman S. The Cooper Clubman non S already comes with a spare tire. 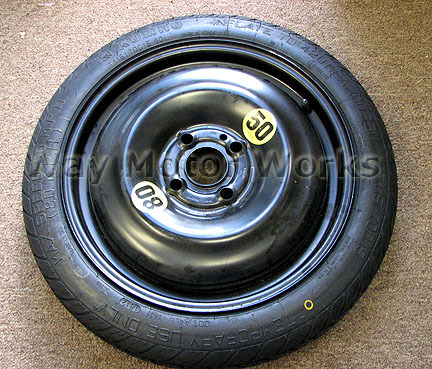 WMW carries this exact spare in our Clubman S. It is lighter and smaller than carrying a full size wheel. This spare is intended to be used on the Rear of your MINI when used. This will prevent transmission damage, and allow you to drive safely. Also this may not clear all front brake calibers, but clears the rear brakes no problem. Spare Tire kit comes as shown in pic Steel Donut Spare rim with tire mounted and ready to install.